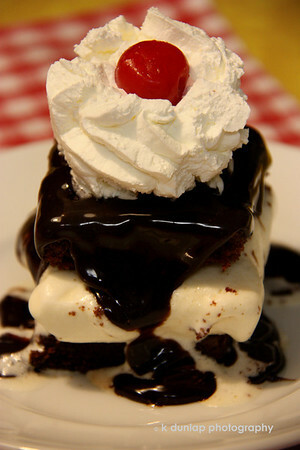 08.18.09 = Following my theme this week of favorite local foods; THE HOT FUDGE CAKE from Frisch's Big Boy! Two pieces of chocolate cake with vanilla ice cream in between; thick hot fudge rolling down the sides; topped with whipped cream and cherry.....good heavens! JenniferD was wondering if they still had the hot fudge cake the other day with my shot of the Big Boy, now you have your answer, Ohhhhh yeeeaaahhhhhhhh! You have officially done damage to my day! Just kidding, but I would really love to eat this right now!!! and I haven't even had breakfast yet! Perfect shot and the melting fudge and ice cream just make it all the more perfect. Thank you so much Kris for your recent comments on my photos..actually over the last few months, too! I have been on only sporadically and here and there I try to take some time to comment, but truly don't think Ive really taken enough time to enjoy your photography. You have a great energy and wonderful spirit to what you capture..I am sure that is a reflection of who you are. Keep clicking! Wonderful happy variety of images! I need this right now to get me through the day... but in a calorie free version! Excellent image which turns this cake into a work of art! You have got to be kidding - don't DO this to me! I want to wolf that down RIGHT NOW!!! Oh my gosh, that looks SINFUL! Mmmmm. i can't believe how amazing that looks! YUM!! and GREAT quote at the bottom. One of my coworkers is the perfect example of this quote!